The president of the European Commission has issued a bleak warning: financial experts based in London are waiting to crush the Euro if Greece leaves the Eurozone. Speaking to students at the University of Leuven in Belgium, Jean-Claude Juncker said the single currency used by 19 states in the European Union is under threat from the “Anglo-Saxon world” – a term used to describe bankers in London and Wall Street. Juncker added Greece would not be forced to leave the currency as the financial hole it would leave would be too big. “Grexit is not an option,” he said. 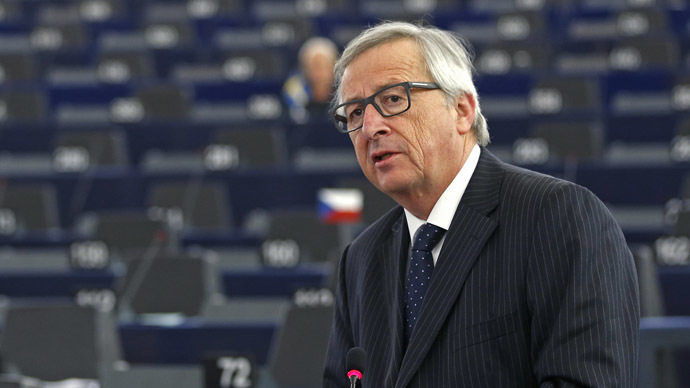 Juncker’s comments have proved embarrassing to officials, as it suggests there is an active plot being prepared in UK banks to subvert the euro, and will doubtless lead to renewed criticism of the head of the European Commission. Despite hopeful beginnings after Greece’s general election, forecasts for the country’s economy have been drastically cut by Brussels. Greece has recently unveiled plans to tax cashpoint withdrawals in an attempt to raise cash and prevent money leaving the country. Britain’s financial industry, however, has more on its plate than plotting to take down the Eurozone. Overseas investors with links to the UK have withdrawn cash at an unprecedented rate during the past year amid fears the result of Thursday’s general election could prompt domestic instability. According to the latest figures from CrossBorder Capital, more than $360 billion has been withdrawn over the past 15 months, with large sums from Russian investors vanishing in the wake of sanctions. The withdrawal of investment has triggered concern about the strength of the pound overseas. Mike Howell, chief executive of CrossBorder Capital, said the data “certainly showed money leaving sterling … It’s either UK investors wanting to get into foreign assets, or foreign investors wanting to get out of the UK. I think the data does reflect uncertainty around the election.